If there was ever a photo that summed up what a Non Station was, it was this photo. 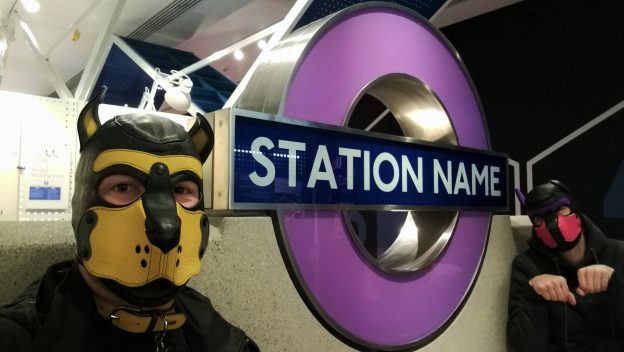 Taken at the exhibit for the future at the National Railway Museum, this example roundel for the Elizabeth Line (and the first Pup All The Stations crossrail roundel at that). When Echo and I laid eyes on it, we both looked at each other, knowingly. It was a sign, it needed pupping. There was a non-pup with us so he became the beast of burden with all the camera equipment and bags while we got ready for our shot. We were hampered by the public buzzing around for the longest time, but soon we were able to get our hoods on and get the shot. A security guard had been hovering around but he didn’t seem interested in stopping our activities (for which we thank him). We then got the shot and went about viewing the rest of the exhibits, rather chuffed we’d managed to get such an unusual sign.